There must be a gene for cake eaters that my mom passed down to me. My waistline tells me this, as does my craving for cake. I try to keep cake eating to special holidays. Anniversaries are great because you can create them to celebrate the start of all kinds of things in life. And an anniversary of a beer store calls for cake, with beer! We first opened our store on January 20, 2007, which means I have a new reason celebrate with cake. And this is an anniversary that I can “go big” with and share with our wonderful customers. Back in Shakespearean time, the water wasn’t fit to drink, so they drank ale with their cake. 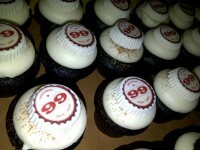 So what’s more fitting than a beer store to serve ale with cake? 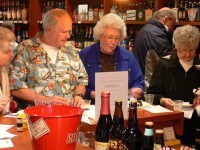 I started planning the first event in 2007, baking cakes and pairing then with beers at home. This gave me a good foothold of things to look for and realize how a little frosting or filling can totally change the direction of the ale on the tastebuds. We started this event with three beers from Rogue Ales before moving onto the beer-and-cake pairings: Hazelnut Brown Nectar and Chocolate Stout paired with white cake with caramel fluff filling. The general consensus was that both beers tasted great with the cake, but Hazelnut was the favorite due to its melding in the mouth with the caramel fluff. Cake from Something Delicious Bakery, Kent, Wash.
We started Kuronama Black as a palate teaser before the beer-cake pairing of: Kona Pipeline Porter (winter seasonal), Unibroue Trois Pistoles, Moylan’s Ryan Sullivan’s Imperial Stout, and Lindeman’s Framboise (raspberry dessert ale) paired with rich chocolate cake with cream cheese filling. The stout, lambic and coffee porter were sure things, but I threw in the Belgian-style as a palate teaser and wildcard. Everyone who drank beer with their cake had a chane to vote, and the “sure things” were nearly tied — check out the results. Cake from Something Delicious Bakery, Kent, Wash. 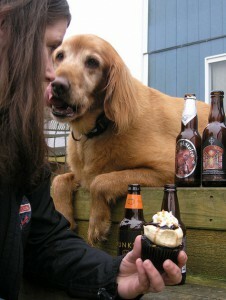 This success of this second-year event led to an interview on pairing baked goods with beer in Modern Baking magazine. This year we skipped the palate teasers and jumped right into the pairings. Avery White Rascal, Snoqualmie Falls Steam Train Porter, and Firestone Walker Union Jack IPA with carrot-pecan-spice cake with luscious cream cheese filling. The cake was more like “spice cake”, with the carrots ground so fine that you didn’t realize there were any veggies in it. Though the prospect of having veggies in their cake decreased the number of attendees by about 20 folks, and those who skipped out for that reason really missed out on a fun and delicious pairing. The preferences on the pairing was a dead-heat this year between the porter and the IPA; the dark beer lovers were swayed toward the porter, while the hoppy fans went for the IPA, and a handful of wheat beer fans chose the witbier. 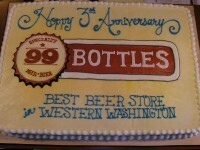 Cake from Corina Bakery, Tacoma, Wash. Read beer + cake musings for more about these pairings. Prior to our fourth anniversary, I found myself again being interviewed by Modern Baking magazine about pairing with baked goods. This time, we talked specifically about cookies and cupcakes. They also asked me to take some photos for use in the magazine; this called for a special trip to PinkaBella to pickup some goodies. Next time you’re throwing a celebration for adults, forget the coffee, milk, or juice (unless it’s a milk stout or coffee-infused beer or a fruity lambic ale), and go for the gusto: Serve Beer With Cake!